February, 2015, Gay weddings in some states are being challenged. Alabama has become the next state to try to hinder gay weddings. Alabama Chief Justice Roy Moore has decided to ignore the US Supreme Court’s ruling 18 months ago that legalized gay marriage in all 50 states. Many Alabama judges are agreeing with the Chief and not issuing marriage licenses to all couples regardless of their preference of who they want to marry. Already, some gay couples are finding it more difficult to find a legal authorized State employee to provide them their rights. Couples are having to drive longer distances and wait. The homophobic chief justice of the Alabama Supreme Court does not agree with the US government. “At this point, I am not defying the United States Supreme Court,” the 68-year-old Christian judge and Republican said. He said “It couldn’t serve as precedent because we ruled first,” Justice Moore referred to the Supreme Court ruling, Obergefell vs. Hodges. Gay weddings have been occurring in every State. 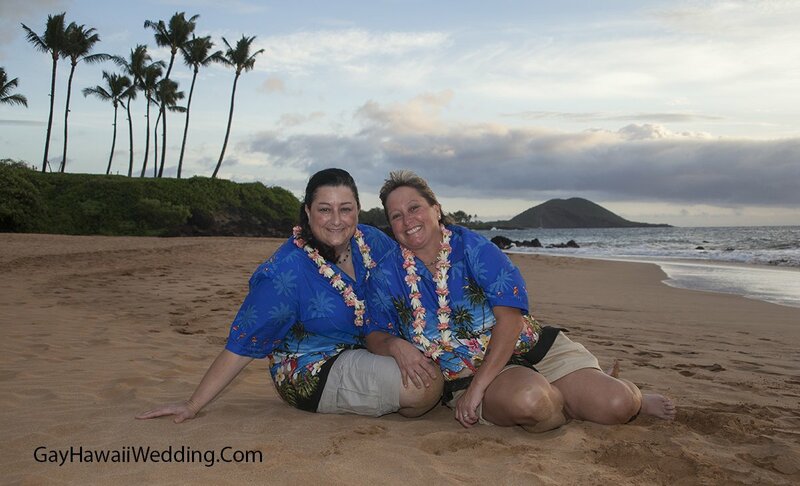 In Hawaii, Gay Hawaii Wedding has coordinated over 800 legal gay weddings since 2013. Alabama gay marriage is threatened by this activist because of his religious beliefs. We in Hawaii welcome all gay Alabama couples to come to Hawaii and get married and honeymoon if they so desire. In the meantime, we continue to offer moral support and informing the LGBT community on what is occurring in Alabama. Update: Jan 21, 2105, President Obama said today the US supreme court decided the case for all 50 states and that Alabama will eventually have to comply. Maui, Hawaii remains the best place to get married and honeymoon for gays and lesbians. Many couples from around the world come to Maui, Hawaii to get married. 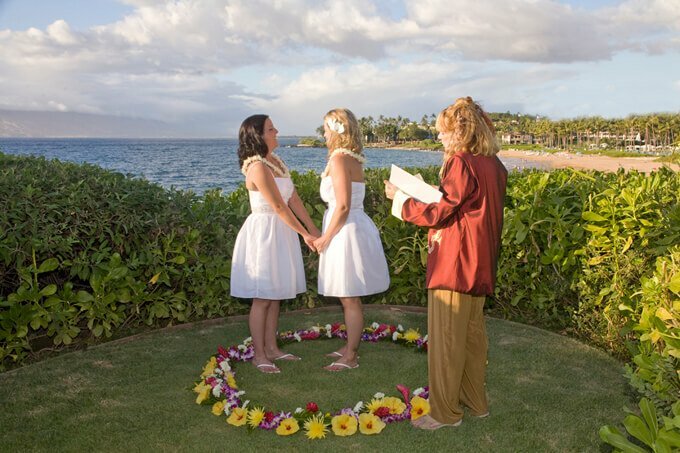 Gay and lesbian weddings on Maui Hawaii are recognized in your respective states as well as federally and all couples from all other states that get married in Hawaii will be recognized on a federal level. 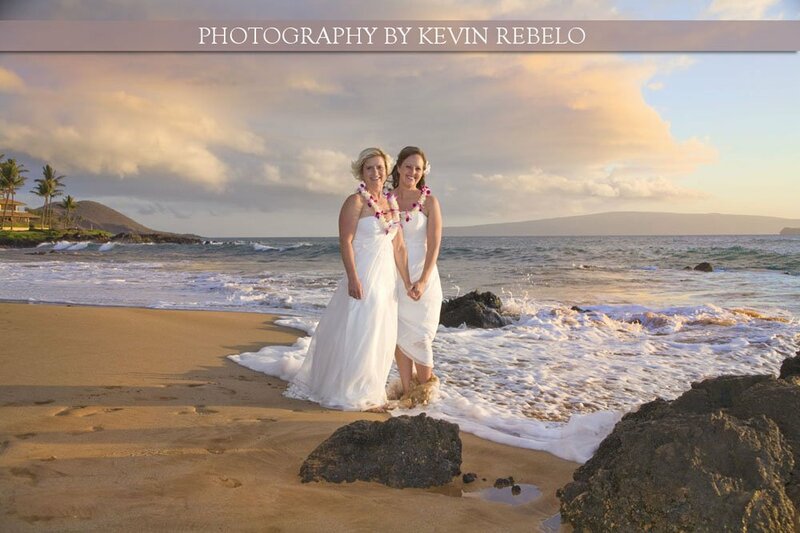 See our LGBT Maui wedding package pricing here. Couples who reside in countries where gay marriage is legal will also be recognized. 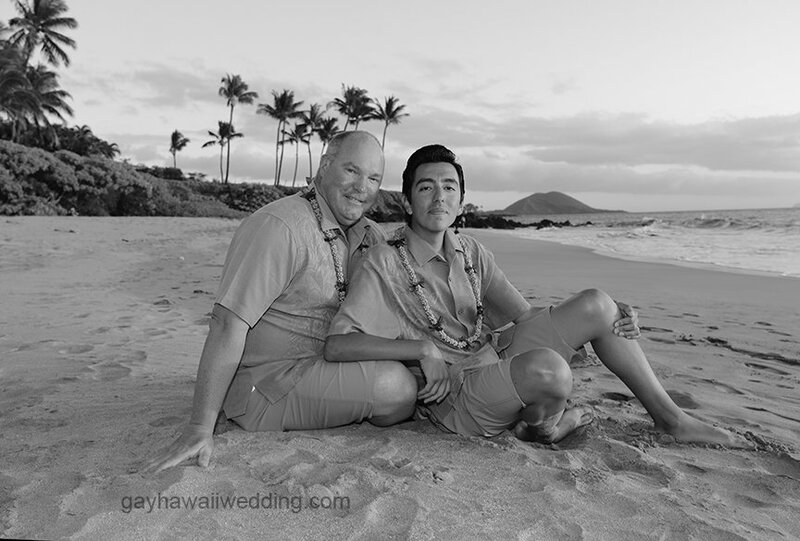 GayHawaiiWedding.com is a gay Hawaii owned and operated wedding company licensed in Hawaii since 1994. 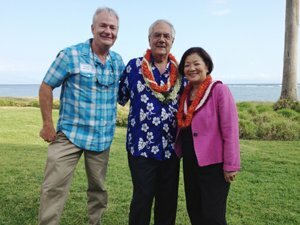 We were the only wedding company that had been advocating for marriage equality in Hawaii since 1994 starting off with letter writing campaigns and lobbying our legislators. There is no better place to have a wedding and honeymoon than Maui, voted Best Island worldwide once again. (20 consecutive years, a record). We are a very gay-friendly island. View our Yelp! Reviews. We are well known in the Maui community and are members of the Hawaii Visitors Bureau and the Maui Wedding Association. We have been featured on NPR Radio, local newspapers and most recently on ABC News (click on the link to the right to see the report). We were also featured in USA Today. Click on gay wedding packages (at the top of page) to see pricing and gay wedding locations. Please note other wedding companies are now also advertising gay weddings on Maui but most are not LGBT owned and operated. To reserve your Maui wedding, call us toll-free (800) 859-0072 or email us today. Thirty Two US states (and D.C.) recognize Hawaii’s gay marriages. If your state does not recognize your rights yet, at least you will be legal in Hawaii and many other states. 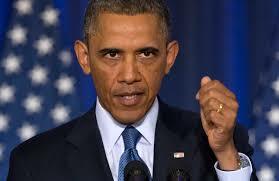 Your marriage will be recognized federally and you will get all federal benefits regardless of what State you reside. Did we mention that Maui is very gay-friendly? Please see our list of gay and gay-friendly Maui hotels and condos. 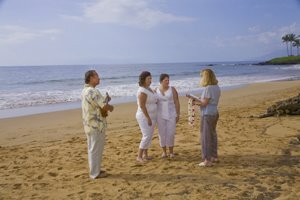 Why get married on Maui? Maui has been voted best island word-wide for 20 consecutive years by readers of Conde Naste magazine and is the ideal location to have your wedding and honeymoon. This year Maui was voted the world’s favorite travel destination surpassing destinations such as Sydney, Florence and San Francisco. We have the best beaches, waterfalls, 10.000 ft volcano, hiking, and year-round warm sunny climate. Please see our list of Maui wedding locations. Your Hawaii wedding ceremony can be religious or non-religious. 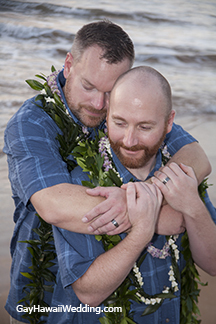 View our Gay Hawaii Wedding Ceremonies Here. Ceremonies begin with a welcome, followed by the Vows. Couples repeat traditional or contemporary vows, or couples can recite their own. Rings are then exchanged, followed by a brief closing. There are four ceremonies that we can perform. Wedding couples may select one of the following ceremonies. You may also write your own vows if you so desire. 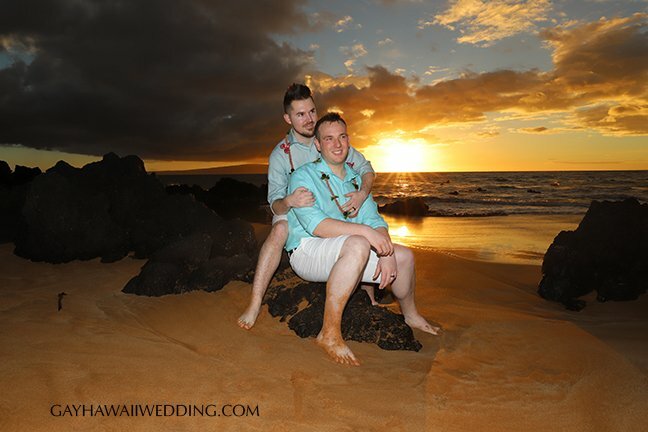 We have created several gay Maui packages that you can select. Our simple and complete wedding package is $395, followed by packages that contain, photographers, videographers, flowers, hair/make-up and many options. It is your Maui wedding, and you can have it however you want! Aloha.